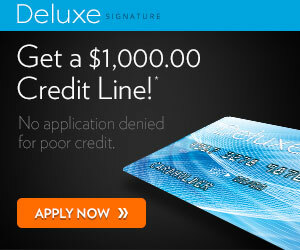 Deluxe Signature Card provides consumers the opportunity to get a great catalog card with up to a $1,000 credit line. No applications are turned down for poor credit! If you are looking for buy a perfect gift but are low on cash, this could be a great option. If one of your big ticket items has suddenly broken, this could be your much needed opportunity to be able to replace it. Sign up today to check out their extensive catalog, and start shopping. There's no monthly fee, the application is free, and everyone is approved for a Deluxe Signature Card. I don't think so. I believe this is a store credit to shop their catalog.